Here’s the first guest post by frequent commenter and sometime observing buddy Doug Rennie. 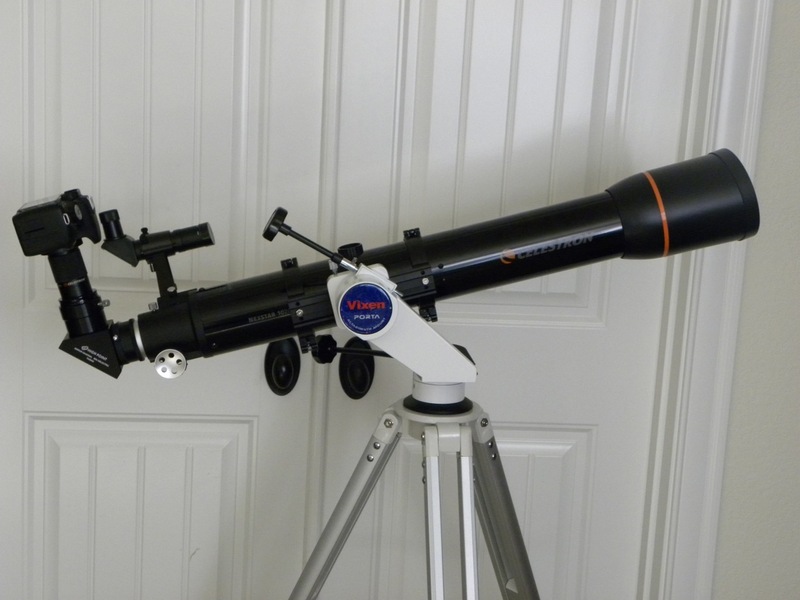 He’s using the same OTA I’ve been using recently–the Celestron 102GT achromatic refractor–but the rest of his setup is different from mine: different mount, diagonal, eyepiece, and camera. Just goes to show that this scope plays well with lots of other gear. I flipped some of the photos to match the orientation of the moon in the sky, but otherwise they are as Doug sent them. The captions and any errors therein are mine. Enjoy! 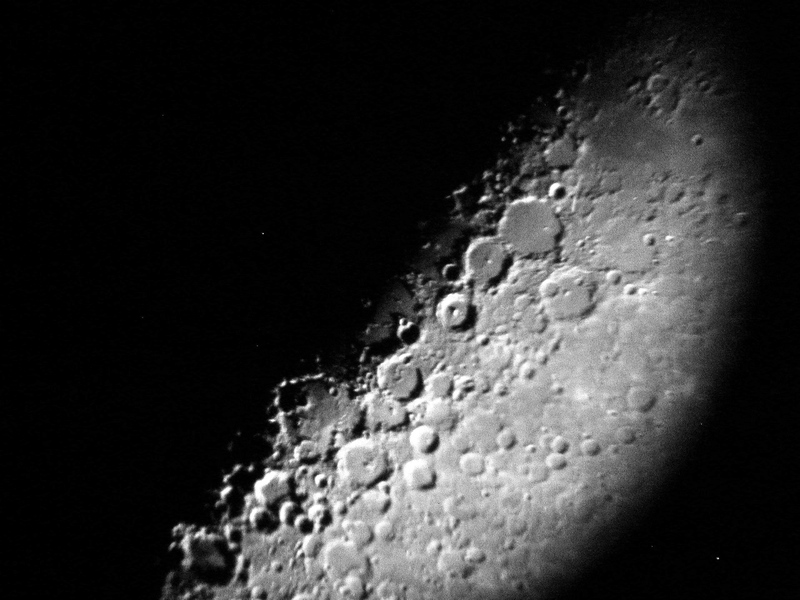 The northeast quadrant of the moon. The landing sites for Apollo 11, 15, and 17 are all in this quadrant. 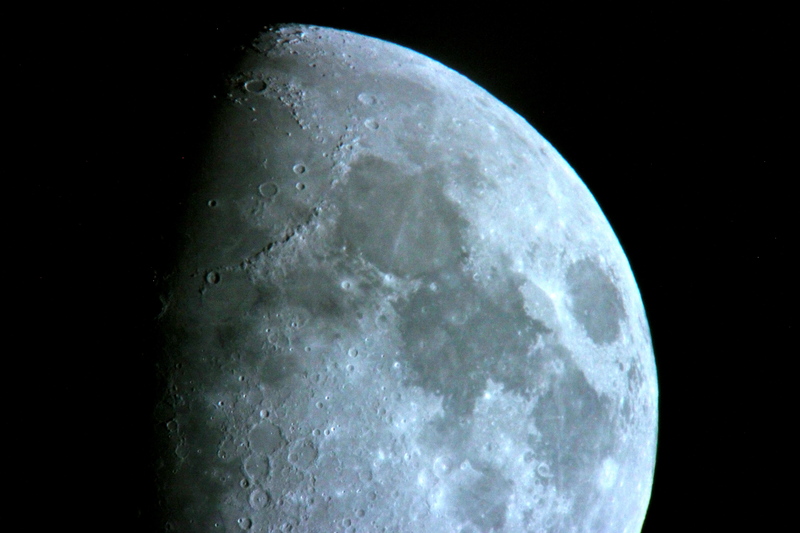 So I went out several nights last week with the waxing gibbous moon looming large and bright over our front courtyard, and took out the C 102 on a Porta II with my Celestron 8 x 24 zoom attached to my DSLR for some eyepiece projection AP. Took a lot of photos, most of them so-so to utter crap, but maybe 8 or so not half bad. I still need to focus more on . . . focus. Note in the photo that I insert the zoom/camera into a 2″ High Point Scientific 99% dielectric diagonal vs directly into the focuser as this is a lot easier to work with, and having done it both ways, I really see no image quality drop-off using the diag. 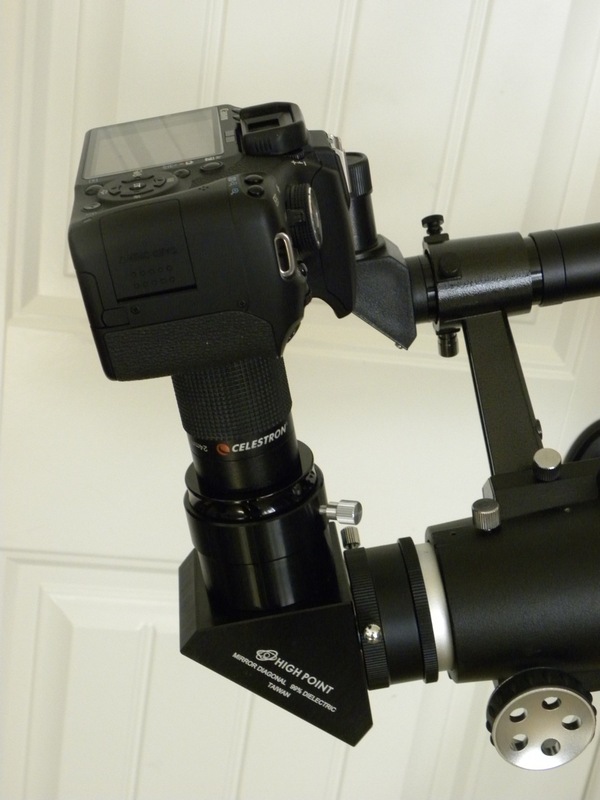 The Celestron 8 x 24, as you can see from the photos, allows the removal of the rubber eye cup which exposes a threaded male connection; this allows the eyepiece to be mounted directly to the t-ring on my Canon T1i DSLR. Eyepiece projection photography. I found that to achieve focus using the LED LiveScreen at the back of the camera (which works well; my eyesight is the issue here) that I need to run the shutter speed up into the 3-4 second range so that the image is bright enough to both fill the screen and capture the necessary (for focusing) details. Once I have focused, I then move the shutter speed back to that which I will actually be shooting at, usually (depending on brightness and how much of the darker Mares fill the screen) anywhere from 1/30 to 1/160, the most common being around 1/60, ISO set at 800 for most. I also use a remote shutter release cable (about 4 bucks through eBay) to cut camera movement/vibration down to next to nothing. With the zoom, I can go everywhere from 42x to 125x magnification, and everywhere in between, with a quick quarter turn. The north-central portion of the moon. The smooth dark crater on the lower left is Plato, and the deeply-shadowed crater with the bright rim far to the north is Philolaus. The C 102, as you pointed out in your report, serves up wonderfully bright, sharply-resolved images and much of this comes through in the photos. Any soft edges are more the result of my less-than-perfect focusing than with any of the optics involved. Also, these are all single shots: focus, click, move on. Stacking? We don’t use no stinking stacking! 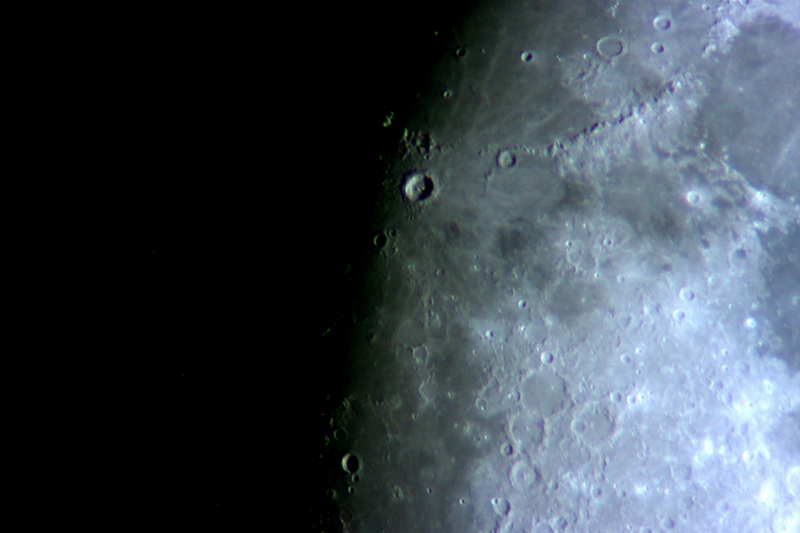 The prominent crater in the upper middle is Copernicus, with the Apennine mountains curving away to the northeast, marking the rim of Mare Imbrium, the Sea of Rains. 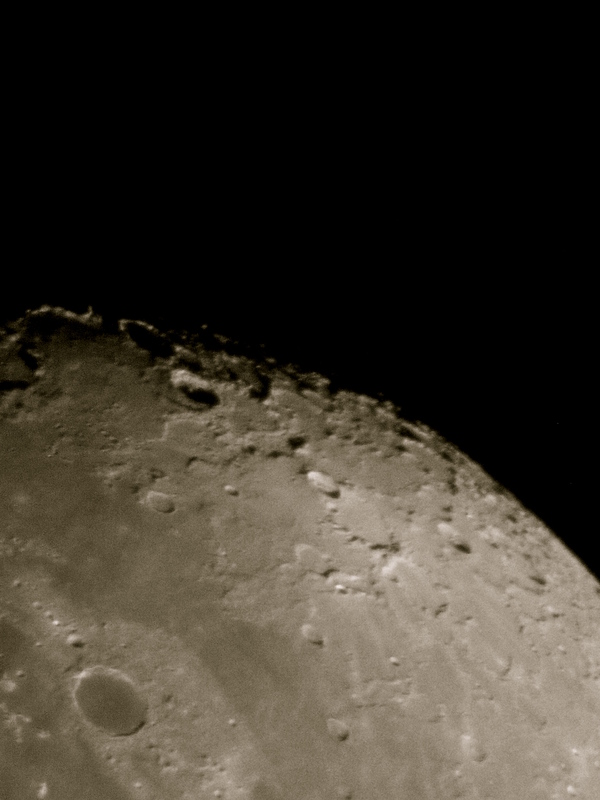 Farther down and to the right are three craters making a backwards comma–these are Ptolemaeus, Alphonsus, and Arzachel (Arzachel has a nice central peak). I am now waiting until Jupiter and Saturn again appear in my observing window, along with M42, M45 and other brighter DSOs as I believe I can capture some decent images with my current set-up, as long as I don’t need to go longer than 12-15 seconds. We’ll see. This shot is from a few nights previous to the last one. Now the backward comma formed by Ptolemaeus, Alphonsus, and Arzachel is right on the terminator, just slightly above and right of center. Frankly, I never see myself getting heavily into AP as the costs alone are prohibitive, plus all the technical stuff overwhelms me just thinking about it. That, and it seems to me that too many of these big time AP guys do little, if any, visual observing, that their views of the heavens mainly come after the fact when they look at the photos they took. Not me. My biggest joy is still what I see at the moment via the EP. But it’s still fun to screw around with modest gear/modest goals AP, especially when its Moony out and that’s about all there is to do. But I am eager to try my new eyepiece projection technique on Saturn and Jupiter when they next appear, and am optimistic that I can even score some good photos of brighter DSOs such as the Orion Nebula and the Pleiades, which won’t be long now. The bright crater above and left of center is Tycho–note the white rays of ejecta on the right that point back to this young, well-defined crater. 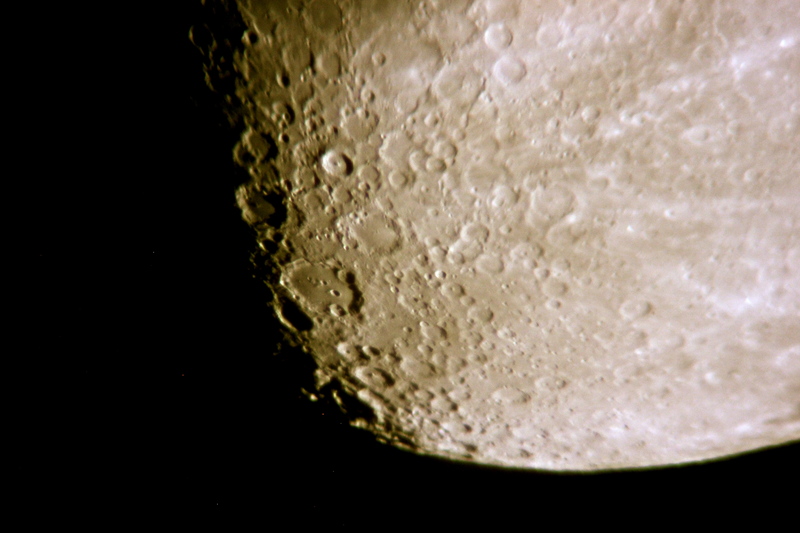 Below Tycho is the much larger, worn Clavius, with a nice arc of craterlets of decreasing size on its floor. Do I understand this correctly….you are doing this without an EP? I have a similar setup, though my camera doesn’t have a T-Thread directly. I have a cylinder, though, that holds an EP inside. I like the looks of the 102 on the Vixen……. No, I use an EP as I describe early on; an 8 x 24 Celestron zoom (you can see it clearly in the large photo, between the camera body and the diagonal). I also used prime focus, but just couldn’t give me the magnification. I think scopestuff sells the kind of tube you’re talking about that holds the EP inside it for eyepiece projection AP. The 102 and Porta II are a good pairing.